When I became a stay-at-home mom in 2014, I felt a pang of guilt for no longer contributing financially to the family. Then, as the weeks of staying home progressed, I discovered something incredible. I had a new superpower. I was so much better at saving money! Not to say I was perfect, but by simply spending the lion’s share of my days caring for little ones AT HOME, I saved loads. Let’s take a closer look at some of those practical ways for stay-at-home moms to save money. Since a mom is involved in so many transactions throughout the week, I thought it’d be best to look through these money-saving tips in categories. Research may show you that buying a car seat new is a wise investment. It may reveal used clothes make a lot of sense for growing babies. Common sense may show you that the French chandelier in your friend’s baby’s nursery doesn’t have to show up in yours, too. Find out if you qualify for a free breast pump. The government may give you a free breast pump or provide you with a reimbursement. I highly recommend checking it out. Be strategic about the professional photo sessions. Social media creates so much pressure for parents to create “perfect moments” during each chapter of their children’s lives. Don’t get swept away in expensive photo sessions unless you’ve planned for them and have the budget available. Load digital coupons. So many stores offer digital coupons. They’re handy and often apply to checkout automatically. Make your own baby food. I am not a DIY maven. However, when I started researching the health benefits of making homemade baby food (and that getting started wasn’t that hard), I gave it a go. Once your baby is ready for solids, try mashing a banana or pureeing some superfoods. Freeze them in an ice cube tray for long-term! Consolidate your trips. Try as I might, I always end up overspending or impulsing buy at the grocery store. Limiting my trips is one way I combat that problem. Another is by ordering my groceries online via ClickList or Shipt. That way, I’m not tempted to overspend and save so much time, too. Pay extra on your mortgage. It’s amazing how much money people can save on their mortgage by paying an extra $100 per month. For example, if you had a 30-year mortgage of $165,000 at 4.5 percent, you’d pay an estimated $135,971 in INTEREST. By paying $100 extra each month over those 30 years, you’d only pay $105,547 in interest. That’s over $30,000 in savings! Try BankRate’s free amortization calculator here. Unplug. You can save a lot of money over time on your utilities simply by unplugging your appliances and shutting off your lights. If the weather is nice, shut off the thermostat and throw open some windows. Reduce extra payments like your phone bill, cable, entertainment subscriptions. What can you trim back in your budget? Can you drop cable? Can you renegotiate your phone bill? Build an emergency fund. Having money set aside for the unexpected will save so much money on emergency swipes of the credit card. Sell your used goods. Today it’s easier than ever to sell your household goods to others. Check out these seven apps that’ll help you turn your secondhand stuff into cash. Earn gift cards to cover Christmas. Swagbucks is one of the most popular sites for earning gift cards. You can watch videos, conduct searches, shop online, or do surveys to earn gift cards for places like PayPal, Amazon, and Target. You won’t earn a living, but it’s a great way to cover birthday presents, weddings, or Christmas. Start a side gig. If you’re a stay-at-home mom looking for a way to make serious money from home, please check out my recent post “14 Profitable Stay-at-Home Mom Jobs Online (That Are Worth Your Time).” It outlines several cash-generating ideas from remote jobs to becoming an entrepreneur. I’ve been piling up resources and tips like this for the last three years after my own debt-free journey with my husband. We went from broke and clueless to budgeting and conquering our financial goals – like me becoming a stay-at-home mom – with the steps you’ve read in this article. 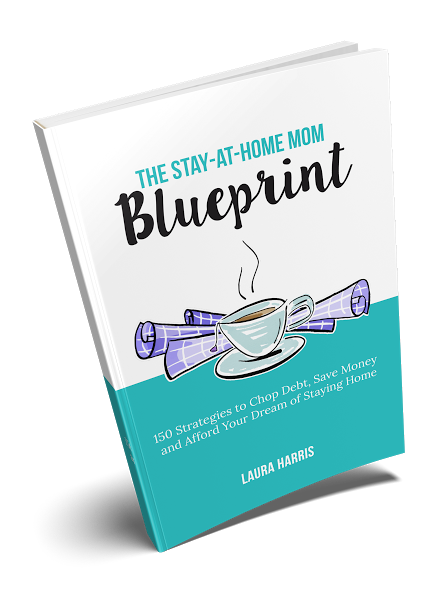 If you dream of the day you can stay home with your kids but could use a roadmap like I did, check out “The Stay-at-Home Mom Blueprint.” This eBook tells my story of beating debt and beating the odds to stay home when we only had $2,000 to live on each month. It also includes 150 strategies to chop your debt, save money, earn from home, and afford your dream of becoming a SAHM. If you liked this list of ways for stay-at-home moms to save money, “The Stay-at-Home Mom Blueprint” is this plus steroids. Your Turn: Share with us a few ways for stay-at-home moms to save money in the comments below! 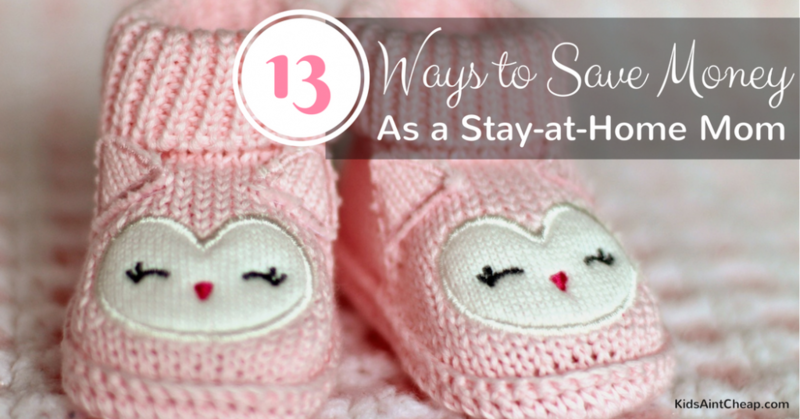 Are you a stay-at-home mom? Check out these bonus resources created just for you! When we first became homeowners six years ago, the first thing we did was go out and invest in a Costco membership. I couldn’t wait to buy 30 rolls of toilet paper, an enormous bag of coffee or 5kg of chocolate chips whenever I wanted. It didn’t take us long to realize we really didn’t yet need a Costco membership though. We were only two people and one of whom was traveling a lot for work and rarely home. When the year was up we let the membership expire and didn’t really miss it. This all changed four years ago though. The biggest mistake we were making at the time of our initial membership was not pricing out our groceries. We were horrible at meal planning and figuring pricing out. We were wasting money in not planning. We also hadn’t looked outside food enough such as baby items (at the time not relevant) or stuff like cat litter. After I started my first maternity leave, and were forced to have a good long look at how we were spending money, and when I look at our big areas of spending I realize how beneficial the membership actually is to our family. I think my newborns entire infant wardrobe came from Costco. They have amazing and affordable baby clothes. Their price on things like diapers and wipes also made the drive over well worth it. 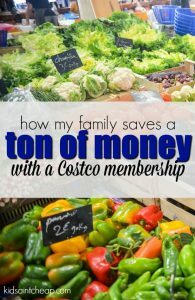 After we got our membership back I no longer had to scour the sales and wait for a deal when it came to things like diapers because I knew they would be cheaper at Costco than any regular store sale. Now that we’re expecting baby #2 I know exactly where we’ll stock up on diapers and wipes! We have always loved to BBq and try to do it year round as it can be an affordable way to cook. The price of propane at Costco is more than half the price that we were paying at the local gas station. Given that we fill it up every few weeks in the summer we save quite a bit of money. Coming next year we’ll also get our gas from Costco too. With an official third mouth to feed, and a husband who was now home more than before, we were going through quite a bit of produce. I did the math and for a lot of our favorite items, it is more times than not cheaper to buy at Costco. Sometimes it’s cheaper for us to buy seasonal items from local stores (like when we have local apples) but non-seasonally, Costco prices and quality is always much better than most local grocery stores. We have capitalized on many services that comes with our membership such as photocenter or pharmacy. Again the pricing always makes the trip in worth it. Our city has had a Costco for as long as I remember but the 30 minute drive made it hard to justify becoming a member given than we’d be driving at least an hour return for our trip, but about six years ago we got one closer to us and now it’s a part of our regular grocery shopping routine. Costco also has a really great return policy, so I know that pretty much anything we buy at Costco we can return – no questions asked. I’ve become price-savvy enough to be able to shop around and know if and when to wait for our Costco trip. It’s a fee we don’t mind spending as we definitely do save way more per year than our membership costs. We’re also at the point now in terms of Costco spending to justify getting the executive membership which, if anything like I expect to earn in cashback, will end up being essentially free for us. 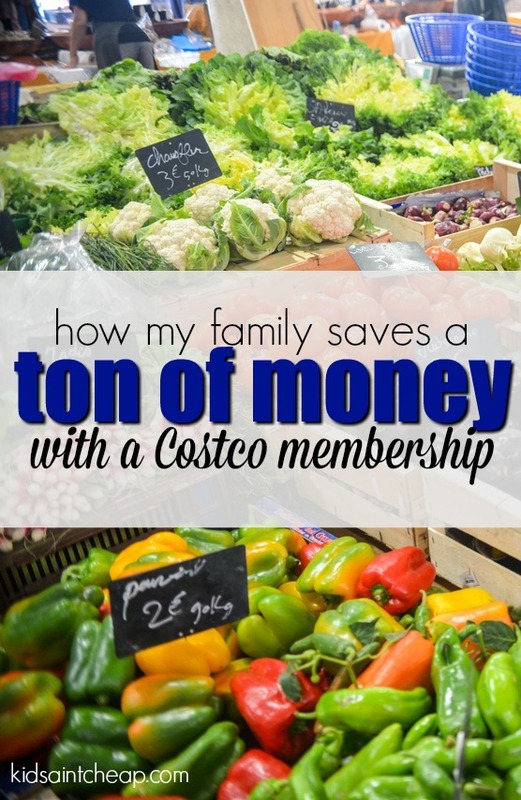 Do you have a Costco membership? 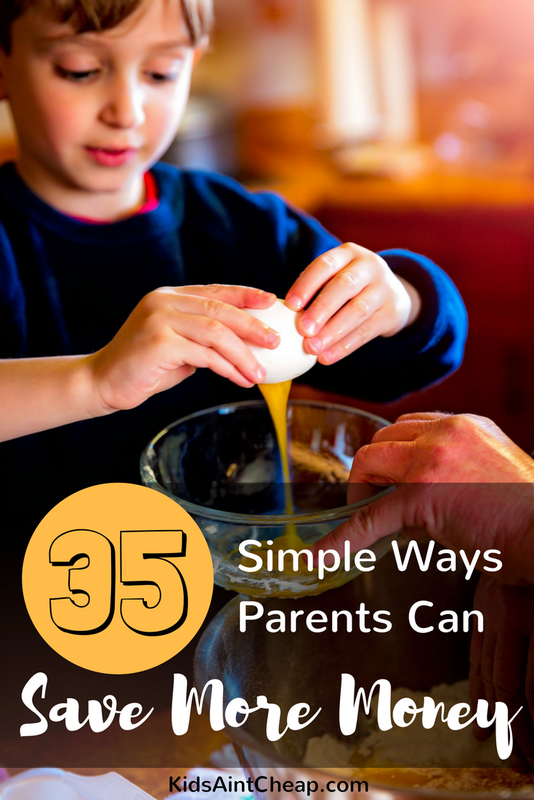 How do you make it work for your family? The other day two of my patients were arguing in my room while I was treating their daughter. The parents were arguing about their upcoming house purchase and what they needed to finish up before closing. The conversation quickly turned from excitement to a full-blown argument about how cheap the wife was. The husband wanted to buy all new furniture for one of their rooms while she wanted to use what they had for a while longer. Her argument was that she wasn’t cheap, but rather frugal, and had the family’s best interest in mind. This differentiation is one that many people confuse. Though they may seem like similar terms, they’re actually quite different in their meaning. 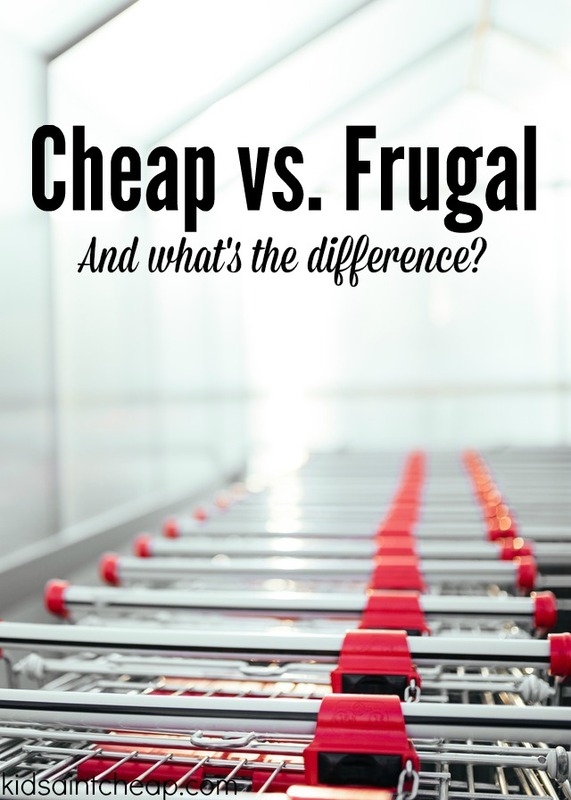 To help clarify the issue here are a few instances concerning being cheap and being frugal. A cheap person may eat out frequently but elect to never tip. If you can’t afford to properly tip when dining out, don’t bother going, it’s cheap to not tip service. A frugal person may elect to not eat out at all, or much more infrequently, as they would rather spend their money elsewhere. When they do make the decision to eat out they pay for everything, proper sized tip and all. If a cheap person needs a new mattress for example, they will go out and buy the first cheap mattress they find, the deciding factor being the dollar amount. Even if this mattress falls apart in a few months they see nothing beyond initial dollars spent. 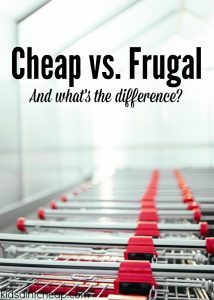 A frugal person will elect to not buy the mattress until they have saved up a dollar amount that will allow them to buy a quality product that will last them years. While they are saving for their upcoming purchase, they may elect to forgo other activities they don’t feel are as important as buying the mattress they need. * This was the argument the wife in my office was trying to make. She didn’t want to buy the cheap couch her husband wanted but wanted to wait until the new year and buy a better quality one even if it meant moving into a brand new house with ‘crappy old furniture’. When it comes to socializing with friends and family, a cheap person may elect to go to events where they know (or assume) someone else will pick up the tab, or avoid going out, ever, because they don’t want to spend the money. This eventually leads to alienation from friends and family. Someone who is frugal will go out but will likely be pickier about when and where they go but they won’t avoid socializing all together. They will also likely come up with alternative social ideas like taking turns hosting a nice dinner in, rather than spending money at a restaurant. Frugality is a way of life. It can be very advantageous when used wisely and lead to many more opportunities in your life. Being cheap however usually ends up in wasted money and missed experiences. Only one of these ways of life knows the true value of a dollar earned. 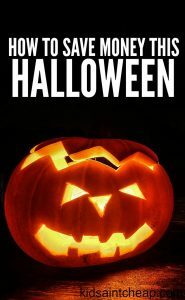 Like most holidays, Halloween can be expensive. For us, the costs are split between costumes, decorations, candy to give out and stuff to make for our daughters Halloween party at daycare. I was hopelessly optimistic that we could accomplish all of this for under $30. Boy was I wrong. To start, the cost of candy was significantly more expensive that I remember (even from just last year). I want to be prepared for at least 100 kids and a box of 50 candies was coming in at $15. Half my budget. I accepted we would be over budget so I did what I could to re-coop costs in other areas. Here’s how we’re saving money this Halloween. I was happy when our daughter announced she would be a princess and wear her favorite pink dress-up dress which we already owned (on clearance last Halloween so scour those racks this November!). The only request she had was that she wanted ‘’princess gloves’’ which my husband found for less than $5.00. If you don’t already own the costume that you require, look into making it. Making it isn’t always cheaper though, especially if it requires a lot of items you don’t already own, but look into materials cost as a start. Also consider time to make the costume. Another option is to look online or second hand stores for used costumes. Costumes are often only worn a handful of times and usually in pretty good shape. If you know someone you could borrow from, this is also a great option. I love the dollar store. Especially when I’m preparing treats for my daughters daycare parties. I admit to spending too much time admiring what others accomplish on Pinterest but when you’re working full-time, and the party falls within the workweek, time is limited. For less than $10, I was able to buy everything I needed at the dollar store (as well using a few pieces of candy we had already purchased) to make up little treat bags for a handful of toddlers. The dollar store was also where we found the crown and jewels for our daughters princess costume. I wouldn’t decorating at all if it was up to me, but my daughter wanted to know why we couldn’t. She would ask every day if we could decorate ‘like they did at daycare’, and like her Auntie does. I was about to give in and head to my local dollar store for a few items (I was a kid once who loved to decorate for Halloween too) but thankfully my Halloween-obsessed sister-in-law had some extra stuff laying around which we could borrow for free! Unless you love Halloween more than some people love Christmas, don’t spend too much money on decorations. If you enjoy a few decorations buy a few that you can reuse rather than one-shot deals that you’ll throw out. 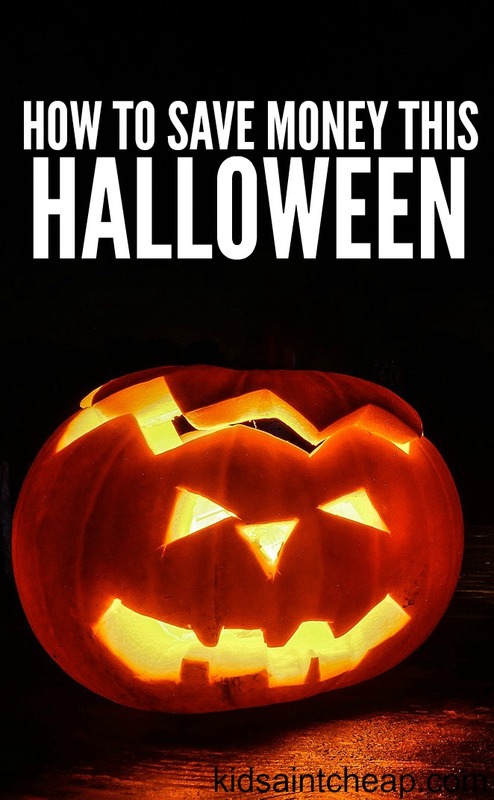 Halloween can be a fun but like anything, busting your budget is never fun. In the end we ended up spending closer to $50 on Halloween this year, an amount I know has the potential to be much higher in years to come. Last weekend I had the luxury of getting out of town with the family, even though we didn’t go very far it was so nice to just get out of our normal routine and boundaries. 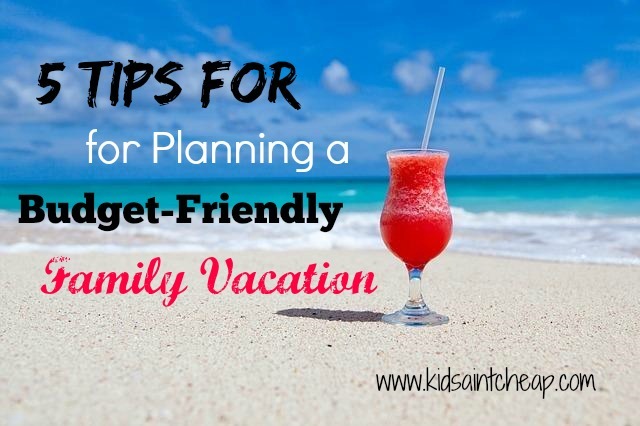 You don’t have to spend a ton of money to enjoy a family getaway. We managed a weekend away for less than $200 by finding some deals and capitalizing on cost savings, you can too. We knew we’d need a hotel for the evening but weren’t interesting in spending a ton of money. I also knew we’d likely be spending a decent amount of time in our room given that we have a little on who is asleep fairly early so wanted it to be comfortable and spacious for my husband and I to enjoy while she was sleeping, without being overpriced. The internet makes searching for stuff like hotels a breeze. I found exactly what we needed for below the price we were willing to spend. We were planning to attend a specific event, if we signed up for notifications from the hosting vendor we would be granted a 25% discount on ticket price. Given that there we a total of seven of us traveling it saved us a decent chunk of money. We also saved on parking at the event itself because they considered us a carpool (more than 4 people), a nice surprise. I hate paying for parking at hotels, given the rate at which they charge you to sleep in a room I think it’s insane to charge upwards of $40 per day in some cities to park your car on top of room rate. I always look for hotels with free parking before ever paying. I also compare the room rate for breakfast vs. no breakfast included. At our particular hotel not only did we have free parking for only $10 more per night then the other hotel we were looking at, we got hot breakfast included. Our family of three certainly can’t eat (out) for less than $10. The hot breakfast is almost always worth the money to me. A few family members were traveling with us to go to the same event to we decided to cut one of the cars out and share the cost in our vehicle instead. They save on wear and tear on their vehicle and we shared the cost of gas which was a help to both parties involved. We also shared a hotel room. Paying for the larger room and extra persons charge was still significantly cheaper than us each getting a room and it was nice to have the extra company! Buying snacks on the road can get expensive. We always pack our collapsible cooler with drinks and light snacks for us and kiddo so we’re not tempted to waste money at gas stations and pit stop locations. We have a child who much prefers to graze throughout the day then eat larger meals so this works especially well for us. With a little planning it is possible to plan a weekend away with your family and not break the bank. Proper budgeting will insure you can get away without worrying how you’re going to pay for it all when you get back! This past weekend my daughter was invited to the birthday of a little girl we know. She was turning six and all I knew was that there was a ”clown theme”. It was the first time I’ve actually attended the birthday party of a child (outside of me being a kid myself) and holy. cow. The party was over the top. I certainly don’t remember ever having, or attending a party of such detail before in my life. It scared me a little into thinking there was some new expectation to have a huge party for kiddo’s upcoming birthday. Having a live clown perform or two hours making balloon creations for every kid present (at least 30 kids), a full kid-friendly magic show and all sorts of attention for the birthday girl. Multiple treat bags full of stuff for each kid. Only invite the child’s friends/family. There was simply no way this little girl was friends with every child there. Invite only kids that your child actually interacts with. There is no rule about mandatory invitation to every child in their class. Don’t have it during a time when a meal may be expected. Only serve snacks and keep them to a minimum. 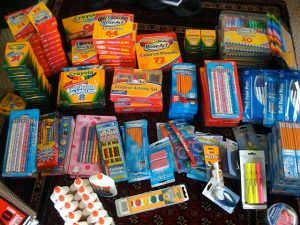 Depending on how many people may be present, buying in bulk at a store like Costco or Sams Club may be the best option. If you do serve a meal make or buy something that is inexpensive but can serve a lot of people (lasagna, pizza, pasta, BBq burgers/dogs) or consider a potluck meal. Look into group party discounts at local attractions. I know the local movie theater here offers a pretty good price for a large group (movie ticket, snacks, room rental and cake all included). If you’re only inviting close friends and family it can be a reasonable option. If you start with extravagant parties, especially so young, there will be an expectation for years. I’m not suggesting you shouldn’t have fun and celebrate their special day but keep it within reason. This can’t be the new norm! I remember having my friends over for pizza and games, as we got older possibly a sleepover, not an all-out afternoon event with every kid in the neighborhood. Put the focus on your child having fun, not money spent. 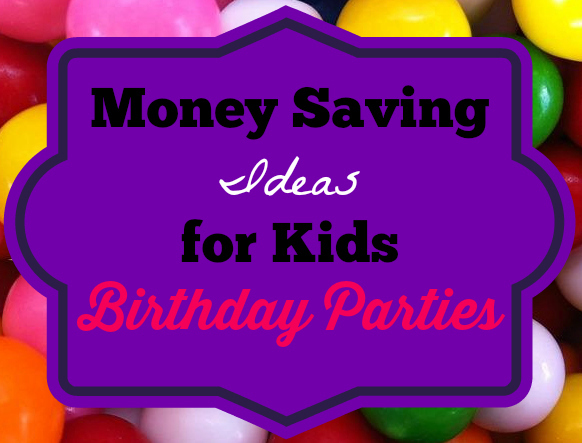 How do you save money on kids birthday parties? Do you want to save money in an environmentally conscious way? Going green can sometimes seem expensive. Especially when you compare the shelf prices of green products verses regular products. But, by trying to live a more environmentally conscious lifestyle you can help make the world a better place for future generations to come. If you’re trying to go green without breaking the bank here are three ways you can do just that. Going green is becoming increasingly popular and because of this many green items have a hefty mark up. One of these items is household cleaners. Baking Soda: cleans and deodorizes. Isopropyl Alcohol: can be used as a disinfectant. White Vinegar: will remove grease, mildew, and some odors. Cornstarch: can be used as a window cleaner or as furniture polish. There are also all types of combinations you can create to replace your favorite name brand cleaners. You can easily find a natural recipe for the cleaner you need online. In addition to household cleaners you can make your own toothpaste, soap, and laundry detergent. The next time you think about throwing something out check and see if it can be recycled. By recycling you can help out the planet and even put some cash back in your pocket. You can recycle things such as aluminum cans, copper, steel, plastics, and paper. You should also think about recycling appliances and electronics. You can reduce your carbon footprint by practicing computer recycling, cell phone recycling, and the recycling of your other electronics. You just need to find a recycler like Vernon Technology Solutions to help. Don’t forget about up cycling, either. A lot of times you can breathe new life into an old item. Things like small furniture, fabric, and old flower pots can be refurbished or turned into something new. 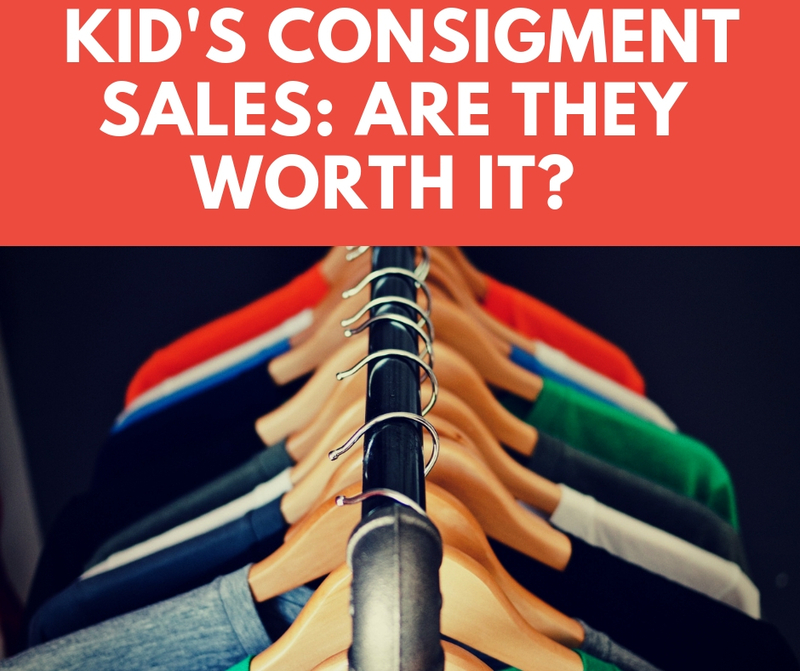 If you don’t want to up cycle an item consider selling it or donating. This way your unwanted items won’t wind up in a land fill somewhere. Another great way to reduce your carbon footprint is to rent instead of buy- this is especially true with electronics. If you occasionally need a tablet you can rent ipads instead of buying them. The same goes for renting computers. When you’re in a bind you can rent a computer for a specified time rather than shelling out hundreds of dollars for a new one. Reducing the amount of harmful impact you do to the environment isn’t limited to just these three things. There are others things you can do to help out the planet and your pockets. There are many green things you can incorporate into your everyday life. The little things you do can have huge impact. How do you save money by going green?